Home » chad tucker , cheatin heart , greensboro , humor , infidelity , marriage , north carolina , revenge , wghp , what the hell were they thinking » Do you think Jennifer is angry at Michael? 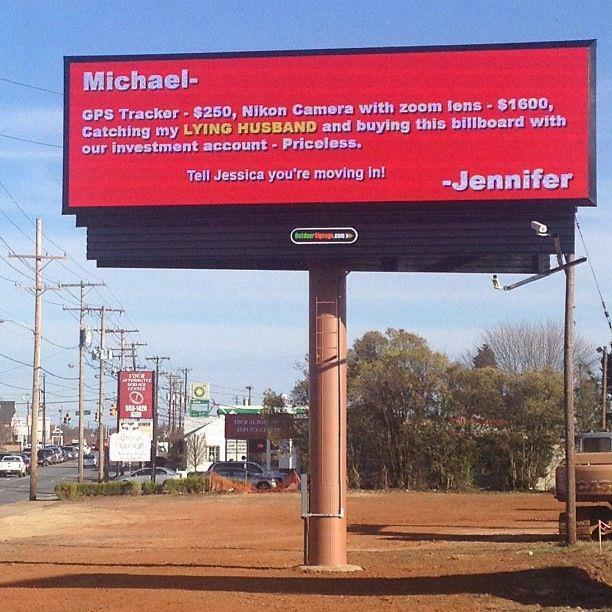 Do you think Jennifer is angry at Michael? Tip o' the hat and credit due to journalist Chad Tucker of Fox 8 WGHP, who posted this on Facebook a short while ago! I saw that today coming down Battleground! Its not fake its really there. It has to be real, there are too many photos of it now. I haven't personally seen it but I'm gonna be in Greensboro tomorrow anyway and if it's still up I'll take a photo of it. This thing has caused at least one car wreck so far. It's also NON-rotating: Jennifer's message to Michael stays put. Is everyone who is crashing named Mike? I knew it was fake when I saw "Nikon camera..." it's 2013 who buys Nikon anymore? it's Canon all the way baby!